Cutnall Green Halt was a short-lived stop on the GWR line from Worcester to Wolverhampton Low Level. Opening in 1928 in a predominantly rural and sparsely populated area, the halt only survived until the mass cullings of 1965. 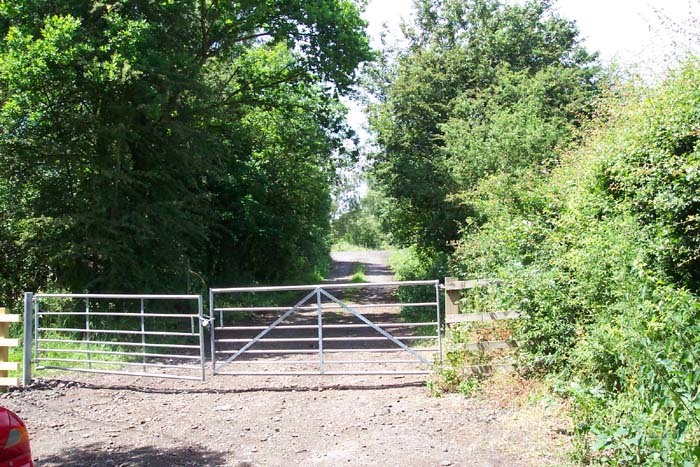 Photographs of the halt when operational are rare which may be something to do with its fairly isolated location and relative lack of significance in the development of the line. 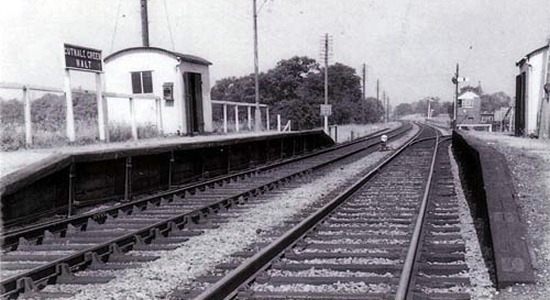 However, above is a shot from 1962 (photo: Lens of Sutton) showing the halt being of wooden construction with basic waiting facilities. 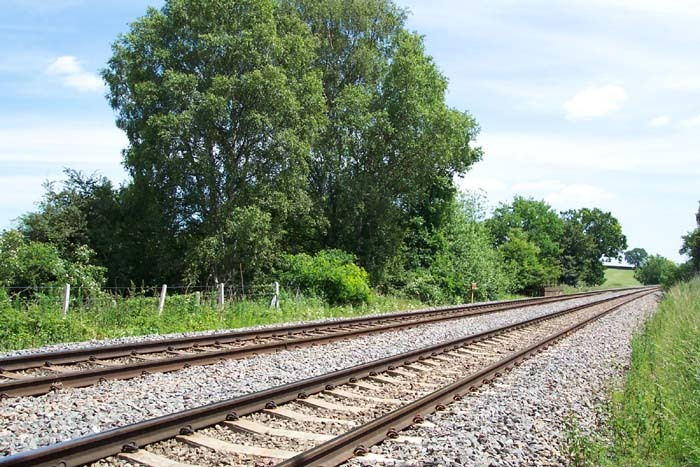 More interesting is that beyond the halt we can see a branch-off to our right which served an MOD base, and beyond it a GWR signalbox controlling the junction with the MOD line. 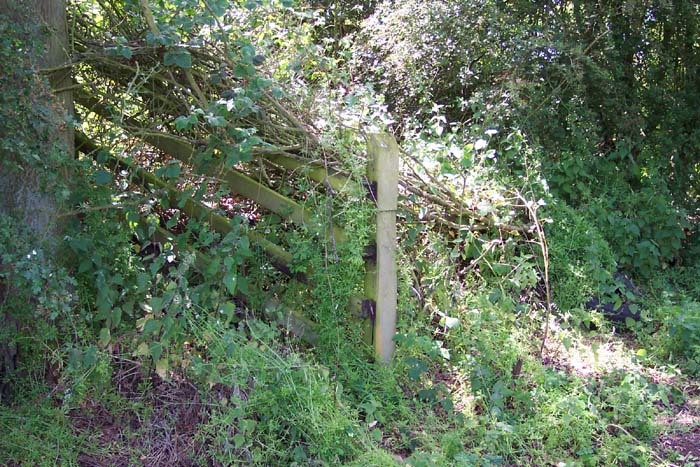 Above-left we see the entry point to the halt, with the railway on an embankment to our left, as it is today off New Road. 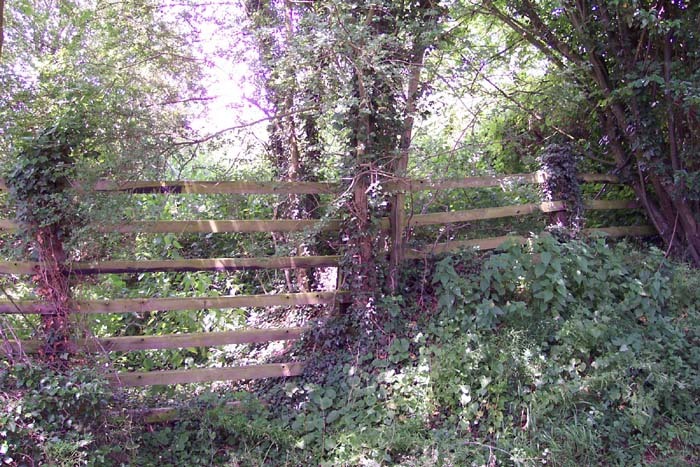 Above-right we have moved towards the gates shown above and to the left can be seen remains of old wooden railway fencing at the entrance to the halt, hidden away in the shrubbery that has grown-up over the last 30 years. Above-left we have reached the top of the approach drive and are looking at the spot that was once occupied by the platform and entrance. As can be seen, nothing remains today. The platforms would have been of wooden construction which makes for finding remains a lot harder after their removal. 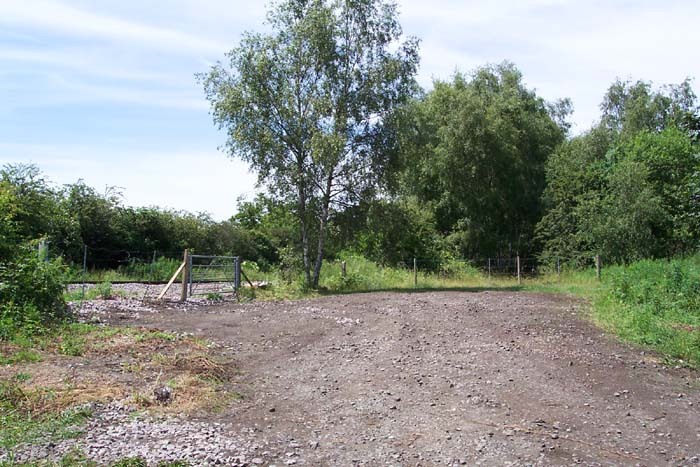 Above-right we are standing on the ground that was once occupied by the Wolverhampton platform looking across to the site of the station driveway seen above which is down the embankment beyond the fence seen the other side of the track. Above-left we have moved back to the Worcester side of the tracks and are standing roughly where the platform once stood with the entrance driveway to our rear and looking in the direction of Wolverhampton. 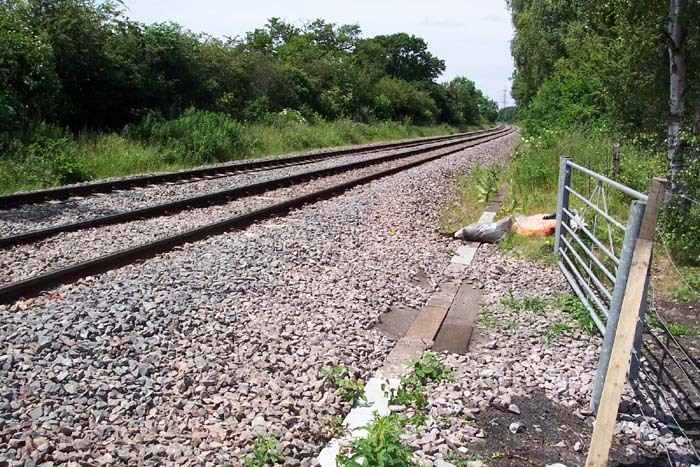 Above-right is pretty much the same view as for the previous photograph but looking at the trackbed where we can see sleepers embedded into the ballast at the point of the gate. 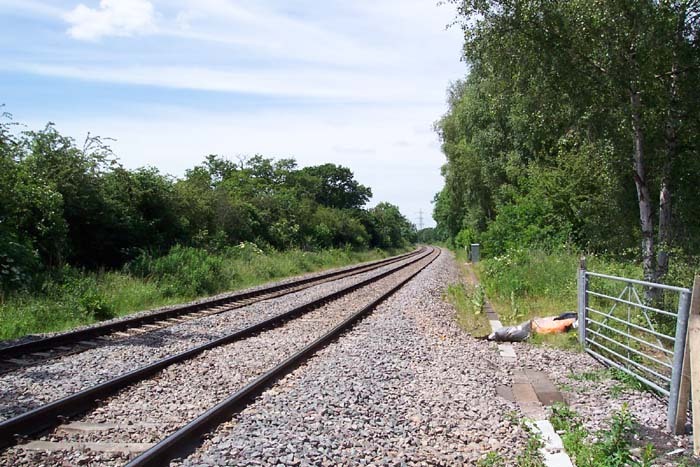 The MOD branch would have crossed directly in front of us here heading to our right with the signalbox dead-ahead. Above-left we have moved back down the driveway and are on what I think was New Road - between Cutnall Green and Doverdale - as I did tend to keep losing my bearings driving around incredibly narrow country lanes in order to find this halt. 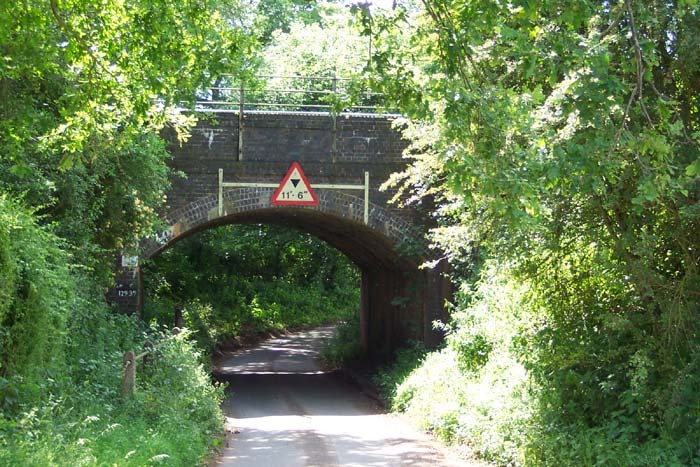 Ahead we see the bridge carrying the railway over the road with the station site to our right. On the left of the bridge, although completely impassible due to foliage, is a raised footpath that goes under the bridge. 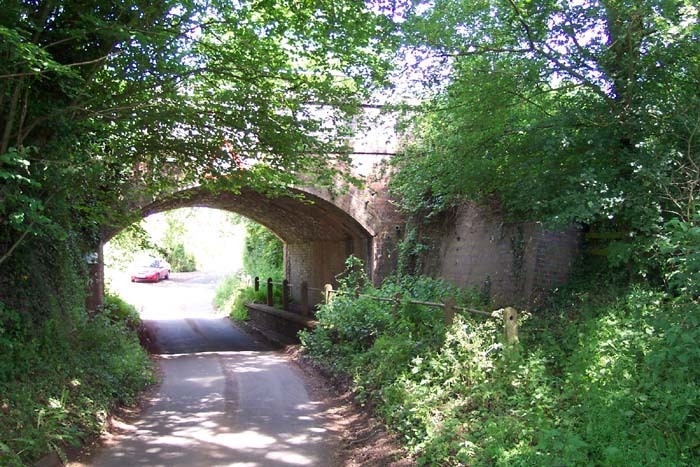 Above-right we have walked under the bridge and are looking back through it in the direction of Cutnall Green itself with the station site now to our left. Above we are in the same spot but have turned to our left and are looking at what appears to have been the pathway up to the Wolverhampton platform - now obstructed by the fencing. This is not one of the greatest sites to visit in the region and I wouldn't recommend it: it would also be totally impossible to visit without a car as it is in a very remote spot. I fail to see why the GWR felt it necessary to build a halt here at all and seem in agreement for once with the Beeching Report that brought about its demise. I am aware that there was an MOD site in the area and a branch from Cutnall Green served that site so maybe the base provided passengers (however, I seem to recall reading somewhere that the base opened during World War II), or it was perceived by the GWR to be a possibility: anyone with any information please let me know?